Fear is a powerful → motivator. Fear to miss something or face unpleasant consequences if you don't act are well known motivators. You can also use fear to → discover opportunities because the presence of fear often means that something unknown is about to happen, and with change comes opportunity. Embracing fear means embracing innovation. You cannot grow unless you stretch yourself and take exciting next steps into an unfamiliar territory. Every time you overcome fear you become stronger and learn something very important to be used in future. 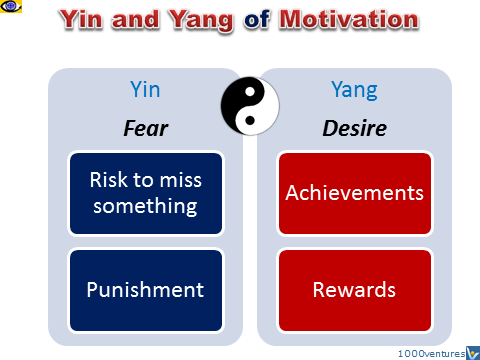 Here is how you can use fear to motivate yourself – and others. Create a miserable picture about your future life presuming that you have never tried to unlock your true potential and never achieved your inspiring vision of the desired future. From that miserable state, look back at your today's choices and regret as deeply as you can that you cannot turn the time back in order to make the right decision and take the right action. Burning desire, aspiration and ambition can be a great motivator. People may desire more achievements, more recognition, more freedom, more time, more friends, more wealth, more → energy, more health, etc. All of these can serve as → positive motivators.